In recent years, people have commonly associated Jaybird with quality; their earbuds are widely considered some of the best available on the market. However, good stuff comes at higher prices—or so we thought. Now, as part of Best Buy's 50-year anniversary sale, you can pick the Jaybird X2 earbuds up for just $69.99. Last time AP reported on a Jaybird X2 deal, the price was $79.99, and you had to be an Amazon Prime member to get them at that price. This time around, anyone can drive straight to Best Buy (or order them online, whatever floats your boat) and pick them up. 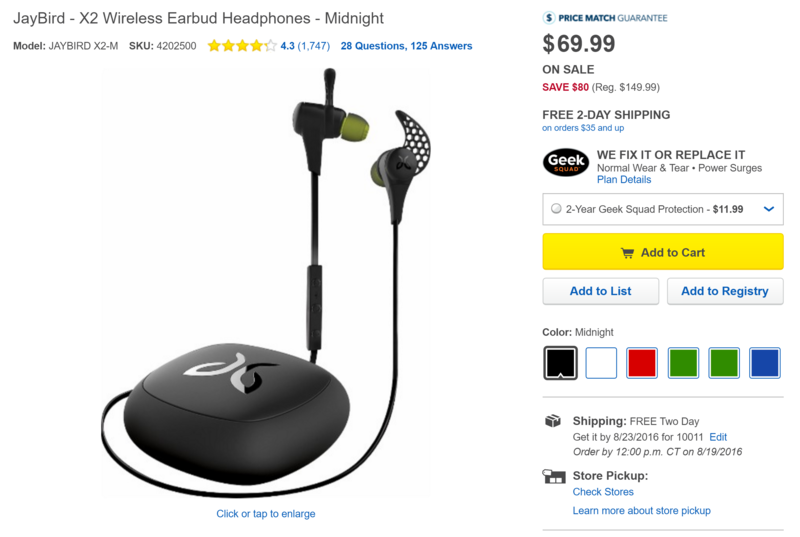 Jaybird's X2 originally retailed for $149.99. Despite having a light, secure design, they offer eight hours of battery life, a mic, and media buttons. They come in Midnight (black), Storm (white), Fire (red), Alpha (camo green), Charge (a greenish-yellow? ), and Ice (teal). Unfortunately, if you really wanted one of those last two colors, Best Buy is listing them as out of stock. Amazon currently has the X2 listed at anywhere from $114 to $150, depending on color; Best Buy's $69.99 price is around half that and is almost a steal. If you want a pair for yourself, this deal will end on Saturday (8/20) at 11:59 PM CST/12:59 AM EST/9:59 PM PST.